I think my current favourite is the bottom yellow one. It's the same pattern as one of the green ones but I think it really 'pops' on yellow. For true authenticity, I would have to use a vintage recipe, of course. I did think I only had to whack in a lump of cheese and melt that baby down but apparently you should add things to it. This makes sense otherwise I'd have been better off sticking with cheese on toast. It's so funny MoonDoggie, as kids my friends and I thought these were the dumbest things! (You know how it is when you are a kid lol). 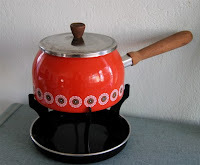 I remember being at someone's house and they had a fondue pot where you cooked your own bite of meat in the bubbling hot oil. I guess they weren't all cheese dips? And warm chocolate dips were fun. Did that once at another friends house. Now I think they are really cool. Those are some fabulous examples! I like the white and orange one the best. I have only one that belonged to my in-laws. I've never used it, but I don't believe I have the heart to part with it, either! hi moondoggie! thanks for stopping by drawpilgrim.com! your blog looks great and i'm adding it to my reader and blogroll. They're all great, but I think my favorite is the second from the bottom. These fondue pots are simply lovely! It's nice to know that I'm not the only one obsessing about fondue, lol! I have 5 fondue pots at home, 3 of them comes complete in a set. 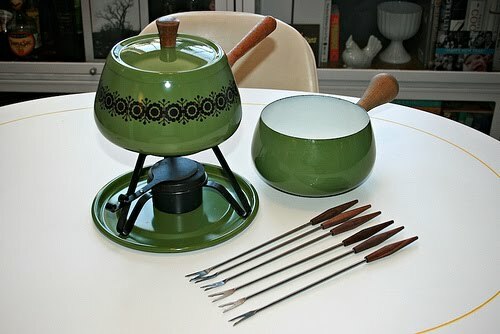 Whichever fondue pot will I be using will depend on what my theme or motif was for the evening. 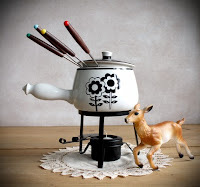 I don't just love throwing fondue dinners, I love it complete with table setting and all! Hi ! I can' believe it , I have the one on your second picture ! Got it from etsy last year . I love the flowers on your 3rd pic ! 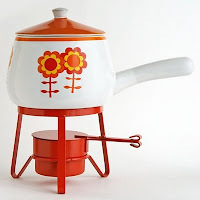 Oh I love la fondue! Thanks for ALL your comments - I love getting them! Fondue - I'd love to see pictures of your fondue table settings. Blue home - Not Fair! Are we on the same blogging wavelength or what? Freaky. 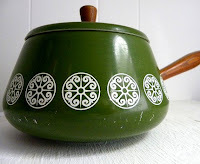 cool pots.